Brescia, 1956 - Augusto and Maria Rosa Corsini, newly married, opened a small store with a coffee roastery. Their motto: ". The smallest roaster ... the best coffee" Much has changed since then ... but not the passion and craftsmanship for coffee. So Caffe Agust became more popular over the years not only in the region but also grew across borders. The family business is now carried on by the third generation - with the same passion and love for coffee as 60 years ago. As a founding member of CSC Italia (Caffè Speciali Certificati), a company that is committed to the absolute quality of coffee, Caffè Agust remains true to its history. Caffe Agust is traditionally roasted by means of gentle, slow drum roasting. 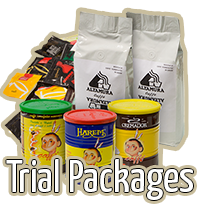 Years of experience, combined with the latest technology, ensure the quality and consistency of espresso blends safely. The espresso blends of Caffè Agust will satisfy the highest demands of coffee lovers: clear, balanced taste of the highest quality! The Cremoso suprises with a wonderfully velvety Crema without disturbing bitter notes thanks to a blend of high-quality robusta beans. The full body is underlined by adelicious, chocolatey taste, which is rounded off with spicy notes. A delicious, chocolatey taste, which is rounded off with spicy notes. Particularly well-balanced having a mild and aromatic taste, with distinctive aromas of flowers, dried fruit, delicate chocolate and exquisite bakery. Its excellent body is suitable for refined palates in search of superior quality. The beans of this espresso blend are certified by the CSC ® Caffè Speciali Certificati, which guarantees the high quality of this exquisite coffee. Specialty coffee by Caffè Agust pre ground for the preparation with filter methods (French Press, V60, Chemex)! For all those who want to experience a sweet, fruity taste in your cup. 100% Arabica coffee blend from organic agriculture. Very mild and delicate, intense aroma with low natural levels of caffeine. Elegance and spiciness from Caffè Agust!